If you like a bit of bling in your life, you are in the right place. This page showcases a wide variety of rhinestone bracelets taking you on an exploration of styles and fashion trends. We start off with trendy fashion jewelry inspired by the POParazzi and Hip Hop trends, move on down to contemporary fashion jewelry bracelets and end up with elegant bridal cuffs and bracelets. In addition to the party and special occasion rhinestone bracelets, I have also featured a rhinestone bracelet that is appropriate for daily wear. There is something here for everyone. If you are shopping for yourself to add to your jewelry wardrobe or for your wedding; or if you are shopping for gifts and gift ideas, it is all here ready for you to browse and make your jewelry selections. POParazzi is among the latest trends in urban jewelry and is inspired by “Basketball Wives” or, in the UK, “Footballer”s Wives’. Rhinestones take their rightful place in creating the look of diamonds and gold that defines celebrity inspired jewelry and of course, at much cheaper prices. This Bracelet is typical of the genre, it is bold and just shouts “See Me”. It was first seen worn by hip hop artists, rappers, and street kings. Big multiple chains, lots of gold, silver and diamonds provided real extravagant and ostentatious displays of ‘bling’ that quickly turned into a fashion craze much copied by us lesser mortals. This bracelet is an example of hip hop jewelry, though not with diamonds, rhinestones provide the bling along with the gold plating. This is the ultimate rhinestone cuff bracelet designed by Kenneth Jay Lane. Stunning addition to your jewelry wardrobe and suitable for just about any occasion. Either of these rhinestone cuff bracelets send a message of being potentially deadly. The makers style the Pirate Skull Bracelet as “absolutely surreal”! It certainly catches the eye. The metal is a silver alloy and the bangle is heavily encrusted with shiny crystal rhinestones. Ideal for multiple occasions including Halloween! Or perhaps your prefer a large reptile. You could certainly wrap this little guy around your wrist! Even though he looks deadly, this crocodile won’t bite. Gold-tone alloy metal is heavily embossed with sparkling rhinestones on this crocodile. This would make a very affordable gift for girls of any age. 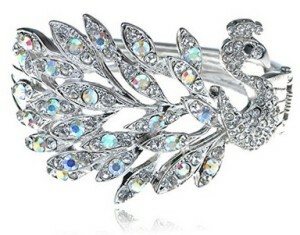 This rhinestone peacock bracelet is, well, as pretty as a peacock! The combination of Aurore Boreale crystal rhinestones and clear rhinestones is dazzling. Like any peacock present, this peacock rhinestone bracelet is sure to steal the show, and most likely your heart. The peacock is a large cuff bracelet and the peacock itself takes up the entire front half of the bracelet and his “feathers” flow vertically and horizontally across your wrist. Elegance and sparkle define the bridal rhinestone bracelet collection. Even women who tend to wear smaller or more subtle jewelry in their daily lives, seek the larger pieces that will show up from a distance for their wedding day. Either of these rhinestone bracelets would be lovely for a wedding or even a social occasion where fancy accessories are appropriate. The bridal cuff and ring offers a completely different and unique style for just the right gown and bride. This is a stunning linked set of ring and rhinestone bracelet. Effortlessly elegant, this is a great fashion accessory to complete your wedding outfit. We all like to have dressy jewelry for parties and special occasions. Rhinestone bracelets are the perfect accessory to dress up an outfit or add the finishing touches to our party attire. In this party collection, I have included a bracelet that has rhinestones paired with pearls for a more traditional elegance that is truly a beautiful piece of jewelry. The multiple row stretch bracelet that is featured below is a very popular choice for proms and dances. Most of the bracelets featured here are for occasional wear and are inexpensive. There is truly no need to invest in expensive jewelry you will only wear a few times in your entire lifetime. However, for the pieces you plan to wear often, selecting a piece set in higher grade metal is necessary. I personally have a rhinestone tennis bracelet that I wear almost everyday coupled with my watch on the same wrist. Since I wear it everyday, I chose the higher grade metal setting for my bracelet, which means it did cost more, but it is definitely worth it. I don’t have to worry about it fading or having to be replaced often. When I find a piece I really love, I do want it to last for years. I also opted for a bracelet made with Swarovski crystal rhinestones. In appearance, there is not much difference, but over time Swarovski crystal rhinestones do not cloud like some rhinestones due to the material used when creating the stone. Beautiful single row tennis bracelets have been in style for decades and they are every bit as popular and fashionable today as they were many years ago. I rather doubt they are going to lose favor anytime in the near future. The simulated rhinestones most often used in jewelry today will not tolerate chemical or cleaners. You must NOT use water or any solvents on rhinestone bracelets. Instead, use a small amount of alcohol on a very soft cloth to clean your rhinestone jewelry. Taking proper care of any piece of jewelry will help keep the piece brilliant in appearance and ensure a longer “life” for fashion jewelry.